Each month as I write this blog I work to highlight issues and ideas that I think will be appreciated by a wide range of readers – athletic trainers, parents, athletes and athletic administrators to name a few. This month I’ve decided to delve into the area of public/community health. Athletic trainers are in a unique position with their patients/athletes. Building trust often leads to athletes and patients confiding in their athletic trainer. This close relationship, particularly in the organized sports setting, can lead to the athletic trainer becoming aware of challenges that athletes face that may not be directly related to their sports participation. Recognizing potential food insecurity could be one of these challenges. To understand food insecurity and the challenges it presents it is helpful to have a few key definitions in place. Food Security – Access by all people at all times to enough food for an active, healthy lifestyle (USDA). Food Insecurity (FI) – Households (who) are uncertain of having, or unable to acquire, at some time during the hear, enough food to the meet the needs of all their members because they had insufficient money or other resources for food (USDA). It has been said that your zip code has more to do with your health than your genetic code. 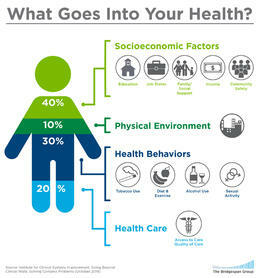 SDoH account for 40% of what goes into your overall health, as demonstrated by image above, created by the Institute for Clinical Systems Improvement. While the care provided by athletic trainers continues to be critically important for sports safety, addressing SDoH like food insecurity can have a major impact on overall, lifetime health. In San Diego County approximately 16% of the population, 504,829 individuals suffer from food insecurity according to the San Diego Hunger Coalition. This is 1 in 6 San Diegans, for children, the number rises to 1 in 5 (SD Hunger Coalition). According to Feeding San Diego their clients are often making choices between food and medical care (medicines and appointments), food and utilities, and food and housing. These individuals could be anyone – military families, college students, and many others that don’t “look” like someone who is food insecure. Perhaps you’re thinking of someone who is homeless, thin and gaunt, or even elderly, but it could be your young junior high and high school athletes or even your college athletes. NPR has recently published a variety of information on the topic of food insecurity and college students. The most recent on July 31, 2018 discusses what some colleges are doing to address the issue. Solutions have ranged from on-campus food pantries, to becoming part of the Swipe Out Hunger program. This year California Berkeley will work to sign up eligible students for CalFresh (SNAP benefits). While the study does not address athletes specifically, I suspect it would be likely that there are athletes who are struggling with food insecurity and may not know where to turn. There have been anecdotal stories, like that of Shabazz Napier and Bo Wallace going hungry and the challenge of not violating NCAA rules. A blog post, by J. Michael Refenburg, Professor, University of North Georgia provides a firsthand account of a college athlete struggling with food insecurity. He highlights many key factors that may lead to food insecurity for athletes, even those on scholarship and despite changes made by the NCAA. I suspect as the issue continues in the limelight more investigation specific to athletes will be considered. In the meantime, what can you do? Asking about food insecurity can be extremely difficult. Often those who are struggling with food are embarrassed to admit they do not have enough food for themselves or their families. Additionally, if dealing with minors, ultimately it will be important to engage parents or guardians before proceeding with recommendations. While not required, there are two validated questions you can ask to screen for food insecurity. 1. Within the past 12 months we worried whether our food would run out before we got money to buy more. 2. Within the past 12 months the food we bought just didn’t last and we didn’t have money to get more. If someone answers “yes” to either of these questions they are considered to have screened positive and should be referred to appropriate resources if available. A “yes” to either question results in a 97% sensitivity and 83% specificity (American Academy of Pediatrics). 2-1-1: As a local non-profit operating 24 hours a day, 365 days each year, 211 San Diego is the region’s trusted source for access to community, health, social and disaster services. By simply dialing 211 the call is free, confidential and available in more than 200 languages. 211 provides access to 6,000 services, resources and programs through our online database. San Diego Food Bank: The Jacobs & Cushman San Diego Food Bank and our North County Food Bank chapter comprise the largest hunger-relief organization in San Diego County. Last year, the Food Bank distributed 26 million pounds of food, and the Food Bank serves, on average, 370,000 people per month in San Diego County. Feeding San Diego: Established in 2007, Feeding San Diego (FSD) is the leading hunger-relief organization in the county, providing 25.2 million meals within the last year, and the only Feeding America affiliate in the region. FSD provides food and resources to a network of more than 245 distribution partners serving 63,000 children, families and seniors each week. Focused on healthy food, education and advocacy, FSD is building a hunger-free and healthy San Diego through innovative programs and collaborative partnerships. EatFresh.org: EatFresh.org is an online resource for CalFresh (SNAP, or food stamps) eligible individuals and families, though this website is a great resource for anyone who wants to improve their health. San Diego Hunger Coalition: San Diego Hunger Coalition leads coordinated action to end hunger in San Diego County supported by research, education, and advocacy. ACKNOWLEDGEMENT: A special thanks to Jillian Barber, MPH, Manager Community Benefit and Health Improvement, Sharp HealthCare whose expertise and passion was willingly shared to allow me to write this blog and continue to make more and more people aware of the food insecurity challenge faced by many San Diegans.